When we design your website one of the most important steps we take is to make sure your new website is mobile friendly. Think about it, when your out and about the town what do you do when you need to find a business? You pull out your mobile device and do a Google search for it. Guess what happens when a business doesn’t have a mobile friendly website? Their listing doesn’t appear in the results returned by Google. A while back Google came out and stated that website that were not mobile friendly would not get indexed into their main search listings. Heck they’d be lucky if they were included in the supplementary results. This is why it is critical for your website to be mobile friendly. Leading experts made bold predictions back in 2008 about mobile usage. “Mobile to overtake fixed Internet access by 2014” was the huge headline summarizing the bold prediction from 2008 by Mary Meeker, an analyst at Kleiner Perkins Caufield Byers who reviews technology trends annually in May. The vast majority of Americans – 95% – now own a cellphone of some kind. The share of Americans that own smartphones is now 77%, up from just 35% in Pew Research Center’s first survey of smartphone ownership conducted in 2011. 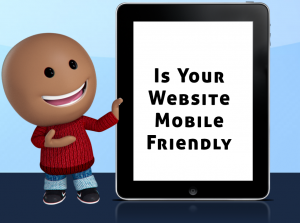 I am certain you can see the importance of having a mobile friendly website. As a client of SJ Mobile Media we will make your website mobile friendly and your customers will love you for it.